user warning: Table './active5_foxes/cache_filter' is marked as crashed and should be repaired query: SELECT data, created, headers, expire, serialized FROM cache_filter WHERE cid = '2:ea5f4b03bd3c0aa1f173acf128f8e552' in /home/active5/public_html/drupal6_multisite/includes/cache.inc on line 25.
user warning: Table './active5_foxes/cache_filter' is marked as crashed and should be repaired query: UPDATE cache_filter SET data = '<p class=\"rtecenter\"><img alt=\"\" src=\"http://www.catchingfoxes.com/sites/www.catchingfoxes.com/files/resize/blog/Grandpa%3ANathaniel-486x365.jpg\" style=\"width: 486px; height: 365px; border-width: 5px; border-style: solid; margin: 10px;\" title=\"\" width=\"486\" height=\"365\" /></p>\n<p class=\"rtecenter\"><em>Grandpa visiting Nathaniel at the hospital in August</em>, 2013</p>\n<p>This weekend marks five years that Rich&#39;s father has lived with us. We considered waiting to adopt until our season of assisting Grandpa was over. Caring for an aging parent in your home is a unique challenge that only those in the trenches can fully understand. Accepting additional responsibility through adoption seemed... let&#39;s be honest... risky? Or extreme? Or radical? At the very least - hard. One of my struggles while taking the foster and adoption classes was the long mental list of the sacrifices I&#39;ve already made for the sake of elderly care. &quot;Surely God, you don&#39;t expect me to take in a child when I&#39;m already giving so much?&quot;</p>\n<p>But God opened the adoption doors. Fast and wide. While still caring for Grandpa.</p>\n<p>And the child He found for us was not the older child that we determined would best fit our family, but a medically fragile infant with a lot of needs.</p>\n<p>Some days nothing about this seems to makes sense.</p>\n<p>I eat breakfast standing up somewhere between frying eggs for an old man waiting at the table and warming formula for a fussy infant waiting in the exersaucer and I wonder if God really knew what He was asking of me.</p>\n<p>Because loving the span of one to ninety-three can be so demanding that I am tempted to fixate on the fact that I&#39;m half way in between - desperately clinging to the American dream tenet on middle age: that it should bring security and ease, not hard risky things.</p>\n<p>To be perfectly honest, most of the contemporary evangelical Christian faith I see around me doesn&#39;t help me here. <a href=\"http://www.amazon.com/Do-Hard-Things-Rebellion-Expectations/dp/1601421125/ref=sr_1_1?ie=UTF8&amp;qid=1393002402&amp;sr=8-1&amp;keywords=Do+Hard+THings\"><em>Do Hard Things</em></a> is written for teens, not forty-something stay-at-home moms.</p>\n<p>It seems more common to leave the faith stretching challenges to our youth or those on mission fields in far away countries as we settle into our middle age, our sofas, and a facade that our personal comfort is more important than our daily radical faith. But it is here in my middle age with the baby on my hip and the elderly man across the kitchen table that I continue to learn that <strong>God actually delights in exalting my inability. He intentionally puts me in situations where I come face to face with my need for Him.</strong></p>\n<p>Caring for a grandpa and an infant at the same time actually makes sense to God. For <strong>there is never going to be a day when I stand before Him and He looks at me and says, &quot;I wish you would have kept more for yourself.&quot; </strong></p>\n<p>Rather He is committed to setting the widower and the orphan in a family because He knows that they not only need that family, but they need each other. 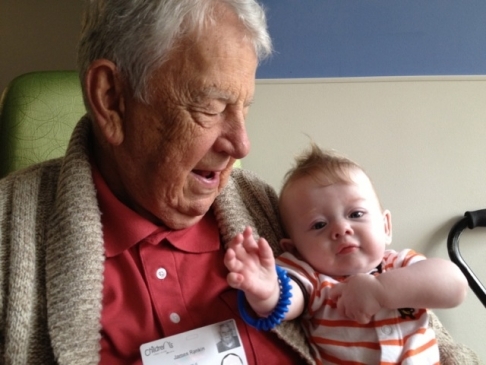 The infant learns to wait on his g-tube feeding until Grandpa gets his eggs and Grandpa learns to wait on his eggs until the infant gets his g-tube feeding and God helps each of them work out their own hard things.</p>\n<p>And He is committed to helping me work out my hard things. Committed to equipping me with sacrificial love on days when I would just rather serve burnt eggs and cold formula.</p>\n<p>Without a doubt this - this flinging wide the doors of our house and loving the lonely - is risky. Or extreme. Or radical. At the very least - hard. From one to ninety-three. And half-way in between.</p>\n<hr />\n<p>Bold typed quotes are from David Platt&#39;s book <a href=\"http://www.amazon.com/Radical-Taking-Faith-American-Dream/dp/1601422210/ref=sr_1_1?ie=UTF8&amp;qid=1393003778&amp;sr=8-1&amp;keywords=Radical\">Radical</a>. Read it.</p>\n', created = 1555822152, expire = 1555908552, headers = '', serialized = 0 WHERE cid = '2:ea5f4b03bd3c0aa1f173acf128f8e552' in /home/active5/public_html/drupal6_multisite/includes/cache.inc on line 108.
user warning: Table './active5_foxes/cache_filter' is marked as crashed and should be repaired query: UPDATE cache_filter SET data = '<p class=\"rtecenter\" style=\"\"><a href=\"http://www.facebook.com/CatchingFoxes\" target=\"_blank\"><img alt=\"\" src=\"/sites/www.catchingfoxes.com/files/resize/social/facebook-64x64.png\" style=\"text-align: center; width: 64px; height: 64px; \" width=\"64\" height=\"64\" /></a><a href=\"http://pinterest.com/kimmrankin/\" target=\"_blank\"><img alt=\"\" src=\"/sites/www.catchingfoxes.com/files/resize/social/big-p-button-64x64.png\" style=\"width: 64px; height: 64px; \" width=\"64\" height=\"64\" /></a><a href=\"mailto:kim@catchingfoxes.com\" target=\"_blank\"><img alt=\"\" src=\"/sites/www.catchingfoxes.com/files/resize/social/mail-64x64.png\" style=\"width: 64px; height: 64px; \" width=\"64\" height=\"64\" /></a><a href=\"http://www.catchingfoxes.com/rss.xml\" target=\"_blank\"><img alt=\"\" src=\"/sites/www.catchingfoxes.com/files/resize/social/rss-64x64.png\" style=\"width: 64px; height: 64px; \" width=\"64\" height=\"64\" /></a></p>\n', created = 1555822152, expire = 1555908552, headers = '', serialized = 0 WHERE cid = '2:48be9f28bc948ea32b70445d0a590c98' in /home/active5/public_html/drupal6_multisite/includes/cache.inc on line 108.
user warning: Table './active5_foxes/cache_filter' is marked as crashed and should be repaired query: UPDATE cache_filter SET data = '<div class=\"fb-like\" data-font=\"verdana\" data-href=\"http://www.facebook.com/CatchingFoxes\" data-send=\"false\" data-show-faces=\"true\" data-width=\"280\">\n	&nbsp;</div>\n', created = 1555822152, expire = 1555908552, headers = '', serialized = 0 WHERE cid = '2:854065b9b61ff8596c8fa62e384317c7' in /home/active5/public_html/drupal6_multisite/includes/cache.inc on line 108.
user warning: Table './active5_foxes/cache_filter' is marked as crashed and should be repaired query: UPDATE cache_filter SET data = '<p><strong>Catch for us the foxes, the little foxes that ruin the vineyards, our vineyards that are in bloom. </strong><br /><em>Song of Solomon 2:15 NIV</em></p>\n<p>Metaphorically, the &quot;foxes&quot; are the damaging attitudes and actions that can creep in and threaten the love relationship of a couple and a home. &nbsp;Catching Foxes is committed to being a resource as you guard against the things that might injure and destroy the harvest you are striving to grow in your home.</p>\n', created = 1555822152, expire = 1555908552, headers = '', serialized = 0 WHERE cid = '2:132a8457abcc78748ef29251eaa8f1d7' in /home/active5/public_html/drupal6_multisite/includes/cache.inc on line 108.
user warning: Table './active5_foxes/cache_filter' is marked as crashed and should be repaired query: UPDATE cache_filter SET data = '<p><a href=\"mailto:kim@catchingfoxes.com\">kim@catchingfoxes.com</a></p>\n', created = 1555822152, expire = 1555908552, headers = '', serialized = 0 WHERE cid = '2:fe7b2055d10a2c25c439ca4710d86502' in /home/active5/public_html/drupal6_multisite/includes/cache.inc on line 108. This weekend marks five years that Rich's father has lived with us. We considered waiting to adopt until our season of assisting Grandpa was over. Caring for an aging parent in your home is a unique challenge that only those in the trenches can fully understand. Accepting additional responsibility through adoption seemed... let's be honest... risky? Or extreme? Or radical? At the very least - hard. One of my struggles while taking the foster and adoption classes was the long mental list of the sacrifices I've already made for the sake of elderly care. "Surely God, you don't expect me to take in a child when I'm already giving so much?" But God opened the adoption doors. Fast and wide. While still caring for Grandpa. And the child He found for us was not the older child that we determined would best fit our family, but a medically fragile infant with a lot of needs. Some days nothing about this seems to makes sense. I eat breakfast standing up somewhere between frying eggs for an old man waiting at the table and warming formula for a fussy infant waiting in the exersaucer and I wonder if God really knew what He was asking of me. Because loving the span of one to ninety-three can be so demanding that I am tempted to fixate on the fact that I'm half way in between - desperately clinging to the American dream tenet on middle age: that it should bring security and ease, not hard risky things. To be perfectly honest, most of the contemporary evangelical Christian faith I see around me doesn't help me here. Do Hard Things is written for teens, not forty-something stay-at-home moms. It seems more common to leave the faith stretching challenges to our youth or those on mission fields in far away countries as we settle into our middle age, our sofas, and a facade that our personal comfort is more important than our daily radical faith. But it is here in my middle age with the baby on my hip and the elderly man across the kitchen table that I continue to learn that God actually delights in exalting my inability. He intentionally puts me in situations where I come face to face with my need for Him. Caring for a grandpa and an infant at the same time actually makes sense to God. For there is never going to be a day when I stand before Him and He looks at me and says, "I wish you would have kept more for yourself." Rather He is committed to setting the widower and the orphan in a family because He knows that they not only need that family, but they need each other. The infant learns to wait on his g-tube feeding until Grandpa gets his eggs and Grandpa learns to wait on his eggs until the infant gets his g-tube feeding and God helps each of them work out their own hard things. And He is committed to helping me work out my hard things. Committed to equipping me with sacrificial love on days when I would just rather serve burnt eggs and cold formula. Without a doubt this - this flinging wide the doors of our house and loving the lonely - is risky. Or extreme. Or radical. At the very least - hard. From one to ninety-three. And half-way in between. Bold typed quotes are from David Platt's book Radical. Read it.